A little info on our nest boxes and cameras. We are running 2 Vivotec IP (internet protocol) P.O.E. (power over ethernet), image sensor 1/3” progressive CMOS, 1.3 MP 1280 x 1024 (720p) resolution @ 30 frames per second with a focal length f=2.5mm aperture F 2.0 lens & day night mode with built in microphones. We are running a internet connection with 15mbs upload speed for a smooth video. Our 2 nest boxes are constructed from grade 1 pine. The bottom of H.M.K.T. 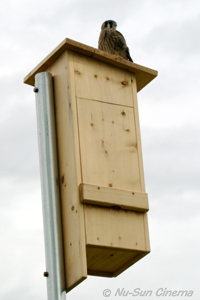 (heavy metal kestrel tree) nest box is situated approximately 14 feet 5 inches above ground which makes the entrance hole about 15 feet 5 inches above ground. This metal wonder was constructed after a heavy wind knocked down the original tree. 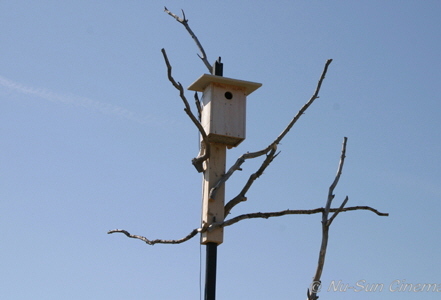 It has the ability to raise and lower the nest box via a crank system from the ground. Some of the original tree branches were used for hunting & perching. The other nest box Kestrel 2 nest box bottom is approximately 10 feet 1 inch above ground which makes the entrance hole approximately 11 feet 1 inch above ground. The entrance hole is 3 inches round on each nest box. 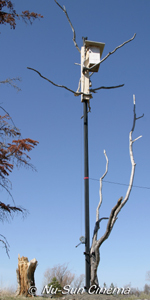 Kestrel 2 box is on a fixed pole and must be accessed with a ladder. They are approximately 100 feet from each other. 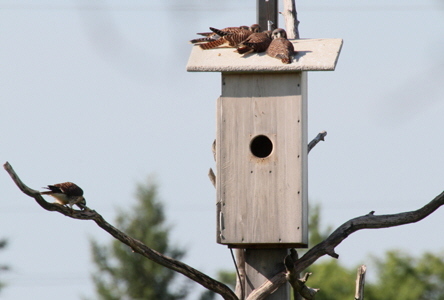 BELOW ARE PHOTOS OF OUR NEST BOXES. The fluidity of the video image on your screen is determined by many factors, including the upload speed of the Internet Provider we use to send the cam signal out (we are using the maximum bandwidth that our provider can give us, but it fluctuates at times), how fast Internet is running between the camera source and your computer (there are several spots along the way where a signal can be disrupted), the download speed of your internet service, and the processor speed of your computer. Our goal is to provide the best viewing experience possible, and we hope that you enjoy watching ! At night, an infrared light is turned on. Falcons and Humans cannot see this light - it is outside their visible spectrum of light. The infrared light is converted into visible light by the camera (but only in black and white), we see the light because it has been converted by the camera. During daylight hours the camera quality may change due to lighting conditions, such as clouds, sunlight & even when the Kestrels are blocking the door way of the nest box. This all will compromise the picture quality due to the only source of light being blocked. We have sound and remember you can hover over bottom right side of stream video to enlarge to full screen. If you have any questions click here info@nu-sun.com Thanks for visiting. Tell your friends about us, and come back often.